With subsidies included, Renault plans to charge 12,000 euros to 14,000 euros for the Zoe electric subcompact when it arrives in 2012. Renault is counting on government incentives and battery-lease programs to help push down electric car prices enough to make them competitive with similar-sized diesel models in Europe. Renault Chief Operating Officer Patrick Pelata said the French automaker aims to sell it Zoe full-electric subcompact for 12,000 euros to 14,000 euros (about $16,510 to $19,260), a price factors in a 5,000-euro government-sponsored subsidy from France. The UK will starting offering a 5,500 pound (about $7,600) subsidy to electric-car buyers starting in 2011. He added that Renault plans to offer a 100-euro-a-month lease on batteries for its lineup of full-electric cars. Renault plans to debut full-electric versions of the 4820mm-long Fluence mid-sized sedan and Kangoo medium-sized commercial vehicle in mid-2011. The Fluence and Kangoo also will be offered in versions with internal combustion engines. Renault is considering a starting price on the Fluence of 25,000 euros to 28,000 euros, with the subsidy included. Pelata did not give an estimated base price for the electric Kangoo. At full capacity, the French automaker plans to make 30,000 units a year each of the electric Fluence and Kangoo. The Zoe is due in mid-2012 and will only be sold as an electric car. 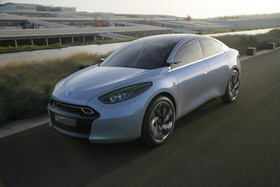 Renault plans an annual volume of 150,000 units for the 4100mm-long car. Pelata said that volume could be doubled quickly if needed. The electric Renault Fluence is due in mid-2011. 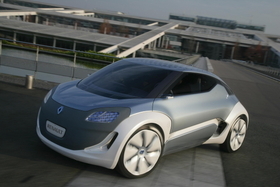 Renault plans to lease the car's battery for about 100 euros a month. Renault is confident that 10 percent of the new cars sold in Europe by 2020 will be powered by a battery rather than some type of fossil fuel. “From 30 percent to 40 percent of cars in Europe are used for daily commuting only, thus the potential is much more than 10 percent for pure electric,” Pelata said. Renault predictions are much more bullish than competitors, which expect electric cars to make up 3 percent to 5 percent of the European new-car market by 2020. When asked about the so-called “well-to-wheel” balance offered by different types of powertrains Pelata said that an electric car is not always the greenest alternative. He said an electric vehicle in Europe has an average well-to-wheel output of CO2 of 62 grams per kilometer. “This figure goes down to 12g/km in France (where much of the electricity comes from nuclear power stations), and grows to about 80g/km when electricity is generated using compressed natural gas,” he said. When the electricity comes from new-generation coal power stations the well-to-wheel CO2 rises to 120g/km. Pelata said the electric cars that get their power from a coal plant will be worse than a gasoline hybrid Toyota Prius (110g/km) but better than a clean diesel (135g/km).